I can’t remember when I first had pomegranates. It must have been during one of my student trips to Europe in the late 1960s or early 1970s. I remember thinking they were really good, the seeds that is, as the skin and inner membranes are inedible. But they always seemed to be bothersome to eat (like artichokes) so they were never really part of my grocery list. Two things happened recently that made me rethink this. One was finding a recipe on the back of an old Christmas card. The other wa s coming across an ingenious method of seeding them quickly and efficiently. I remember my late friend John Lust once preparing a Persian chicken recipe which had pomegranate seeds in it. It may have been Fesenjan, and I can’t help but think that the recipe I found, Pollo alle Melograne, has its origins in Persia (Iran). (I must try the Fesenjan again, as we have lots of walnuts every year from a tree in our yard). The Pollo alle Melograne recipe, I found, is also featured in Giovanni Bugialli’s Foods of Tuscany cookbook (1992) pp. 156-157, and is described as an “old Tuscan Renaissance Dish.” The one I found on the back of that old Christmas card is identical, but does not have a copyright warning, so I am providing it here. 1. Cut the chicken into quarters. Rub the quarters with the tablespoon of butter and sprinkle them with salt and pepper. 2. Heat the oil in a medium-sized casserole over medium heat and, when the oil is warm, place the chicken in a single layer in the bottom of the casserole. Sauté for 2 minutes, then turn the chicken over and sauté for 2 minutes more. Add the wine and let it evaporate for 10 minutes. Season with salt and pepper, then add the cinnamon and a large pinch of nutmeg. Start adding the broth a little at a time, turning the chicken two or three times and adding more broth as needed. 3. Meanwhile, peel the pomegranates, removing all the seeds and discarding the skins. 4. 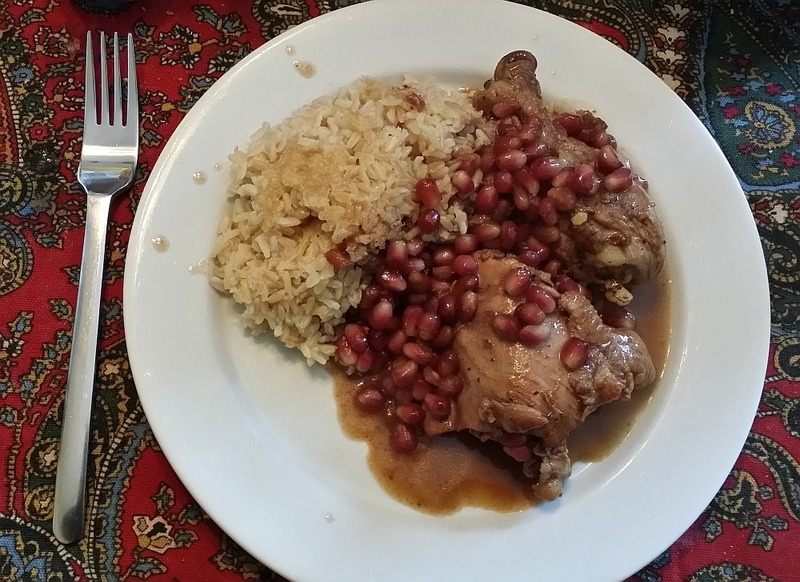 When the chicken is almost cooked, about 25 minutes from the moment you started adding the broth, add the pomegranate seeds to the casserole, mix very well, cover and cook for 5 minutes more, stirring occasionally to be sure the seeds do not stick to the bottom. Taste for salt and pepper. 5. Just before serving, sprinkle the ginger all over the chicken and pomegranates, mix very well and transfer to a large serving platter. Serve hot. Nutrition (per serving): 1008 calories, 659 calories from fat, 73.6g total fat, 251.5mg cholesterol, 233.1mg sodium, 879.3mg potassium, 15.9g carbohydrates, 3.1g fiber, 11.1g sugar, 58.6g protein. Some comments are in order. The flavour is surprisingly subtle and well-balanced. I thought one or two of these spices would overpower the chicken, but not at all! I reduced the recipe somewhat (for two people) so one large pomegranate produced plenty of seeds for the dish, and one cup of stock was adequate. I served it with brown rice and maybe it lacks a bit of colour on the plate. Peas, or maybe a sprig of mint would liven up the appearance a bit, and provide a suitable accompaniment. 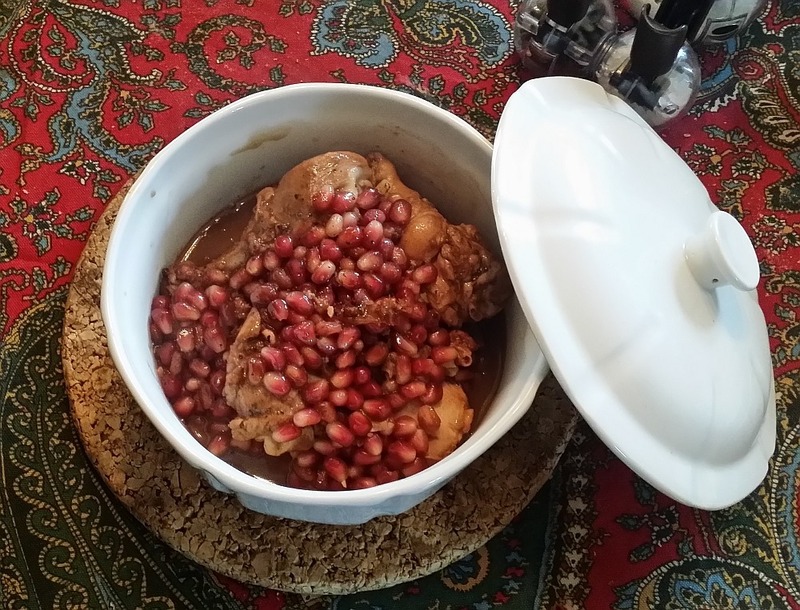 Another recipe I have uses pomegranate molasses. It is a cherry salad, but I will save that one for the summer when we have picked some cherries off our tree in early July.